Created in 1971, the Octagon Gallery is located on the basement level of the Patterson Library. Every year, Octagon Gallery Curator Nancy Nixon Ensign installs 12 shows featuring the work of local artists. The gallery has 105 ft. of exhibition space, 7 12x14 tall plywood walls, 38 black floating track lighting system and pedestals and locked cabinets available for sculptural or delicate works. The goal of the art gallery program is to enhance the cultural and intellectual life of the community by providing exhibitions and services that highlight the visual and performing arts as well as other areas of cultural interest. See below for a full booking information, gallery schedule and past exhibits. Interested in Showing at the Octagon? Behind the Scenes of The Octagon Art Gallery with Nancy Ensign from Patterson Library on Vimeo. 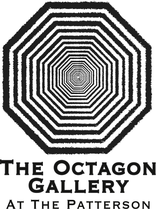 Patterson’s Octagon Art Gallery program is funded in part by the New York State Council on the Arts Decentralization Regrant Program administered by the Cattaraugus County Arts Council.